Abstract. Graphics processing units (GPUs) are an attractive solution in many scientific applications due to their high performance. However, most existing GPU conversions of climate models use GPUs for only a few computationally intensive regions. 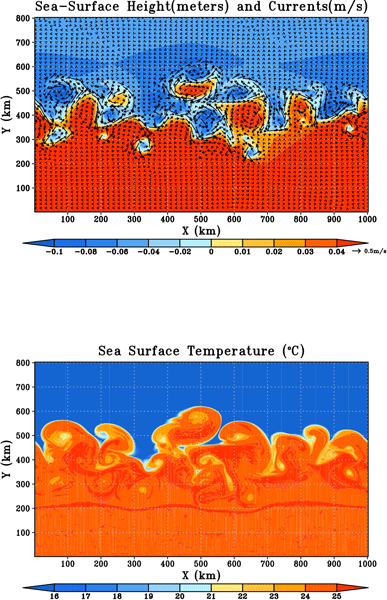 In the present study, we redesign the mpiPOM (a parallel version of the Princeton Ocean Model) with GPUs. Specifically, we first convert the model from its original Fortran form to a new Compute Unified Device Architecture C (CUDA-C) code, then we optimize the code on each of the GPUs, the communications between the GPUs, and the I / O between the GPUs and the central processing units (CPUs). We show that the performance of the new model on a workstation containing four GPUs is comparable to that on a powerful cluster with 408 standard CPU cores, and it reduces the energy consumption by a factor of 6.8. 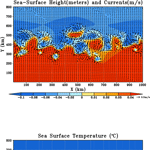 How to cite: Xu, S., Huang, X., Oey, L.-Y., Xu, F., Fu, H., Zhang, Y., and Yang, G.: POM.gpu-v1.0: a GPU-based Princeton Ocean Model, Geosci. Model Dev., 8, 2815-2827, https://doi.org/10.5194/gmd-8-2815-2015, 2015. In this paper, we redesign the mpiPOM with GPUs. Specifically, we first convert the model from its original Fortran form to a new CUDA-C version, POM.gpu-v1.0. Then we optimize the code on each of the GPUs, the communications between the GPUs, and the I/O between the GPUs and the CPUs. We show that the performance of the new model on a workstation containing 4 GPUs is comparable to that on a powerful cluster with 408 standard CPU cores, and it reduces the energy consumption by a factor of 6.8.